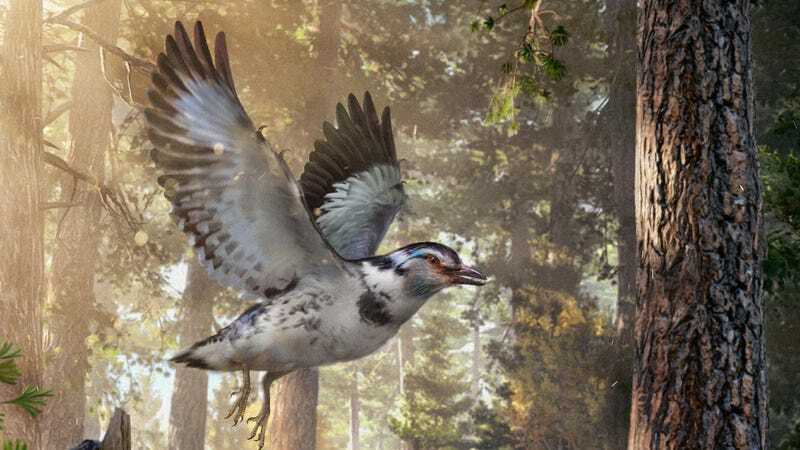 Artist’s impression of Jinguofortis perplexus, a very modern-looking bird from the early Cretaceous. Aside from its short tail, this early Cretaceous bird featured several other characteristics of note. It had a nearly 27-and-a-half inch (69.7 centimeter) wingspan, and its jaw boasted a row of small, sharp teeth similar to those seen on its theropod relatives (yes, that chicken on your dinner plate shared a common ancestor with Tyrannosauruses and velociraptors). The fossil also contained remnants of gizzard stones, which strongly suggests J. perplexus was a plant eater. Fascinatingly, and unlike other early birds, its third finger consisted of just two bones—an early example of a bird species reducing, or fusing, its finger bones (more on this in just a bit). The unique shoulder joint of J. perplexus also tells us something about its flying abilities. The major bones of its shoulder are fused together to form a “scapulocoracoid,” or a fused shoulder girdle (unlike modern flying birds, which have a tight joint between unfused bones). The researchers say this may have helped the birds to grow faster and reach maturity quicker than normal. More significantly, however, this configuration hints at the presence of evolutionary variety, or developmental plasticity, in the development of flight. Considering its body plan and feathers, J. perplexus probably flew slightly differently than birds today. Also, its short, wide wings suggest it lived in dense forests, according to the researchers. Among the findings, Voeten found the fusion of the shoulder bones to be the most surprising. The fused fingers also grabbed Voeten’s attention. Voeten says the discovery of more fossils, both inside and outside of China, will strengthen this line of research further, both in terms of our understanding of J. perplexus and its place within the larger avian family tree. There’s still lots to learn about this important stage in bird evolution, but it’s getting clearer with each new fossil discovery.